The Mount Laurel pond is across from Fire Department headquarters - a key factor in the rescue, Chief Bob Gallos said. Quick action by firefighters, and a boy's winter jacket that expanded like a "flotation device," may have kept a winter accident from turning into a tragedy yesterday in a small pond off Elbo Lane in Mount Laurel. 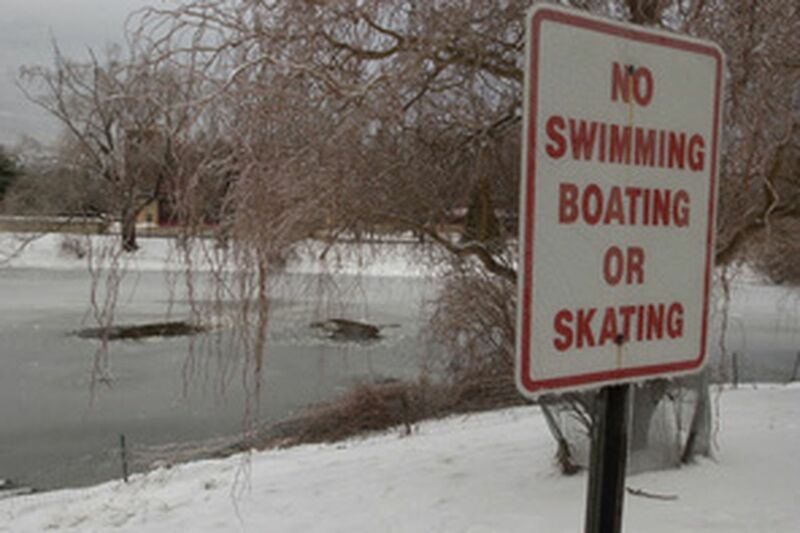 A 12-year-old boy was pulled out of the pond after he crashed through ice while playing with friends. The boy, whose name was not released by authorities, had lost consciousness, but was revived after being rushed to the hospital. Officials at Cooper University Hospital in Camden would not provide any details about his condition last night. The dramatic rescue capped a frantic afternoon that began when three boys were playing with a foam sled on the pond, off a corner of Elbo Lane and Long Bridge Road near the entrance to the Stonegate development. Two boys fell through as they tried to push the sled across the ice. Gerald Lamina, 12, swam and thrashed his way to shore, he said. He then ran to his nearby home, where his sister called in the emergency. As he struggled toward shore, Lamina said, he looked back and saw his friend, whom he identified only as Mark, holding onto the edge of the ice "like it was a cliff." The pond is directly across the street from the Mount Laurel Fire Department's headquarters station. Several members of the administrative staff, including Chief Bob Gallos, were there when the 911 call came in about 3 p.m. They ran to the pond while a team of firefighters donned cold-water gear; the so-called "dry suits" allow them to operate in frigid water. Gallos said he and others had kept an eye on the boy while the rescuers prepared their equipment. "We were screaming to the boy, trying to talk to him," Gallos said. The boy didn't respond, he said. At one point, the firefighters threw ropes in weighted bags, called throw bags, onto the ice. "We got one of the throw bags to about a foot from him," Gallos said. "I think the child just couldn't comprehend what we were telling him to do, or he was just too exhausted." The pond, slightly smaller than a football field, is eight feet deep in some sections, according to authorities. Several residents were along the edge shouting when the rescue began. One woman had tried to go to the boy's aid, Gallos said, but the ice broke under her, and she scrambled back to shore. The boy appeared to be treading water, although his jacket also was serving as "a flotation device," Gallos said. Firefighter James Moyer, in the cold-water gear and a harness, went onto the ice, which broke about two feet from the boy. Moyer, a Marine veteran who served in Iraq, kept his composure and pulled the boy from the water. By then, the boy was unconscious, Gallos said. The rest of the firefighters pulled Moyer and the boy to the edge of the pond. They took the boy up the embankment to street level and began CPR. The boy, who had been in the water five to seven minutes, appeared lifeless, Gallos said. An ambulance rushed him to Virtua West Jersey Hospital Marlton, where, Gallos said, early reports were that he had a pulse and was breathing. He was transferred to Cooper. "Today our training paid off," said Gallos, adding that the proximity of the fire headquarters had been crucial. Lamina's mother, Maria, who rushed to the pond after her son told her what had happened, was the woman who crashed through the ice trying to reach her son's friend before firefighters arrived. She sank in water up to her waist, she said. "This morning we all warned out sons, 'Don't go on the lake,' " she said.